Why pH balance may hold the key to your physical and mental well-being. What do these statistics have in common? One thing: ACIDITY. High acidity, also called “acidosis”, is on the rise. Acidosis occurs when there is too much acid in body fluids. Do you have acid reflux or heartburn? Is your skin dry and cracked? Are your teeth or gums sensitive? Do you get cramps and muscle spasms? Do you suffer from low energy and fatigue? Do you lack enthusiasm for life? Are you frequently nervous or anxious? Are you irritable or grumpy? Do you have arthritis that frequently acts up? If you answered “yes” to any of these questions, then it’s possible that you have a condition called “acidosis”. Acidosis means high acidity in the body. High acidity in the body can cause all of these symptoms, and can also encourage the development of serious diseases like cancer, diabetes, and heart disease. Eating foods that promote acidic body environment. These include: meat and dairy, refined sugars and grains, fried foods, coffee, alcohol, and sodas to name a few. Poor diet, sleep, and drinking habits. Pollution, pesticides, medications, and more. Cell phones and EMF radiation. If you’re like most people, then you’ve already been exposed to ALL of the acid-promoting factors above. Now let’s talk about what can be done about it. Feel healthier and lower your risk of serious diseases. Lower acidity levels mean lower chances of acid reflux, ulcers, and stomach cancer. Most people just feel better when their stomach acid is under control. No more sour stomach! Be beautiful. Feel beautiful. If aging and beauty matter to you, then you’ll be glad to know that alkalizing can lead to smoother, softer skin, healthier hair, and lower body fat. Improve your oral health. Lower acidity means stronger teeth and enamel, fewer canker sores and mouth infections, and less teeth and gum sensitivity. Put an end to pain. Alkalizing has been shown to reduce headaches, muscle cramps, and infections. Feel happier, better, and more alive. High acidity can lead to depression, anxiety, low energy and fatigue. Alkalizing can improve your energy, mood, and your overall sense of well-being. Help prevent bone loss. According to studies, dietary acidity can have significant effects on bone health over time. (4) In one study, women with chronic acidosis were shown to be at greater risk for osteoporosis than women with normal pH levels. Be healthier. Get sick less. Some doctors believe that too much acidity in the body is the cause of many common illnesses and diseases. Immune cells that do not have the proper pH do not work as well. Balancing the acidity in your body by alkalizing can improve cell health. Most experts agree that the pH of your water should be in the range of 8 to 10. Most water is more acidic than that. Plasma pH Drops address this problem by alkalizing your water for you. Alkalizing water helps your body to rid itself of acidic waste and increase oxygen content in the blood. Increasing blood-oxygen levels helps to decrease certain organisms in your body (such as yeast, mutating cancer cells, and bacteria) that thrive in a low oxygen/acidic environment. AlkaVision Plasma pH Drops contain a unique combination of the most alkaline minerals and compounds. You may have heard of pH drops before… and maybe you’ve tried some. If you haven’t gotten the results you were looking for, then you’re in the right place now. Unfortunately there are a lot of scams and “fly by night” operations out there. Some users of “other” pH products have reported testing the products for pH, only to find that the products were not at all what they claimed. We’ve confirmed this unfortunate fact with our own tests. Luckily, for you there’s a better way. These “alka drops” are the best product of this kind on the market. When we started this company, we had only one mission in mind : “To deliver the most honest, effective, affordable and reliable method of increasing the pH of fluids in one’s body.” And we have done just that (and more) with Plasma pH Drops. We’re convinced that our product is the best on the market. In fact: If you can find better pH drops, let us know. And we’ll send you a one month supply of Plasma pH drops for free. If you want to experience the benefits of alkalizing your body through diet and supplementation, then you owe it to yourself to try Plasma pH Drops today. See for yourself what a difference you can make in your own life. There are many ph drops on the market. Ever since we launched 8 years ago many companies have launched their own versions of ph drops, many failed some still exist. 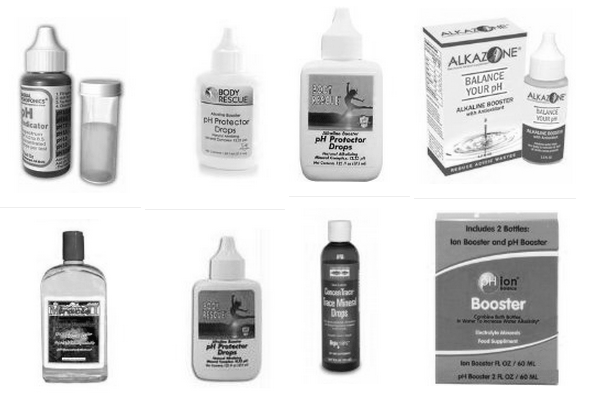 – We always use glass bottle (notice how all of the products above are in a plastic container. This is unacceptable because concentrated alkaline formulas can leach plastic chemicals out of those bottles or even eat right through the bottles (if they do not the formula is probably not strong enough and you are wasting your money). – Because Plasma pH Drops are so strong you only need to use 10 drops per quart/liter this way you have about 115 servings in each bottle ensuring that your bottle will last you several months giving you great value for your money. – Our drops have no taste, smell or color. Some ph drops on the market make your water hard to drink and so you cannot get all the benefits of alkalizing since it will be hard for you to consume the product consistently. Go ahead and try Plasma pH Drops for yourself and you will soon see: this is by far the best product on the market. But don’t just take our word for it. Listen to what your blood says. Look at the below before and after images, and ask yourself: which blood do you want? Cells are the building blocks of the body. Healthy cells lead to a healthy body. Consider the “before” and “after” results below, provided by BetterBlood.net. If you’re concerned about acidity in your body, then you owe it to yourself to try AlkaVision Plasma pH Drops. You won’t find a better pH drops product on the market. When you order by clicking the button below, we’ll ship your Plasma pH Drops right away so that you can begin to experience the benefits as soon as possible. Click the button below to order Plasma pH Drops now. You’ll be glad you did. How much is the cost of the pH drops? Sawthis one and you r claiming u r the best. This is the best product out there, and it has really helped me. However, you have to be consistent about using it. I am here today to buy more bottles. It goes a long long way. I got test strips from Amazon. Mine are in little matchbook looking things. It is actually fun to test the liquid to see what the PH balance is. Your body is going to love this product. Thank you for your feedback and being our valued customer! Will it make my red wine less acidic? I’m in Canada, can you ship up here as well? How many drops per day should we he aiming for? That means about 20 – 30 drops. Many thanks! Is there an expiry date of the drops? what is the best way to store them? i.e room temperature or fridge? I have ice mountain water in a bottle is it good for this product Nd how many drop should I put in the bottle. I have acid reflux and enjoy an adult beverage once or twice a week in the Summer, can I add it to adult beverages (Margaritas and beer)???? I am just wondering about the ingredients in the Plasma drops, plus if someone makes an order that a ph meter would also be an option to get with the order. can i put this in a water fountain for cats? i have a23 cats and a couple them are suffering from open sore and raw gums, tooth sensitivity, ive changed the food, been to the vet they wanted to pull all his teeth for a mere 3,000 bucks ugh!!! done the antibiotics, the dental gels, vibractra plus, new water filters, bottled water, counter filter etc etc with no significant or very brief to minimal change!!!! im at wits end so im beginning to think its the damn water. Hello, i tried the 10 drops in a litre of water and it made me feel a bit off? Do you think it could be to too many drops to start, as everybodys body is different due the acidity content in their systems!!! I know i have been acidic for a long time and now i am making many changes in life with my health!! From cutting sugar out of my diet and trying to eat the foods and avoid foods according the “EAT RIGHT FOR YOUR BLOOD TYPE” book…. I truly feel it is pretty accurate and alot of the food items it states to avoid do not agree with me. Please let me know if i should lower the drops to maybe half (5)? Yes please start with a few drops and work your way up to 10. My father in Law has cancer and it is spreading through out his body he doesn’t feel pain but he is already at stage 5 cancer would this be good for him.He drinks some water at the hospital that is thickend because he cannot drink anything runny.we starting giving him Taigo which is a juice high in antioxidants and vitamin C two days ago and he is already feeling much better.so I wonder if the ph drops would be good for him.He is not getting chemo. It can help for sure! How many drops do i put in 8 oz of water? How long do I have to wait after I put the drops in the water? If I have a Sparkletts water stand with the big jug on top, can I put the drops in the big jug to last all week, or will that not work? ALso can it be used it hot liquid? Please try to drink treated water the same day and in non hot water. How much water can one bottle of ph drops make? Wondering how long it will take me to go through a bottle. Also, we have well water. A man came and tried to sell us a machine that makes your water alkaline. It didn’t work with our water. I started buying bottled water to drink, but that’s not alkaline either. Does the water you use have to have all the minerals in it to work? We have a filter on our well because the water was eating the copper pipes. I don’t know which direction to go. Buy bottled water and drops? Need some advice. Hi Vadim, I’m an exporter & would like to speak to you on an OEM order. Please get intouch with me over my email provided. Thanks. I am strongly considering this product but I frequently take alka seltzer at night before bedtime, will your product have any negative affects if I drink the ph drops in water during the day? Should be no problem, they can even complement each other. I was told to just add baking soda to your water for the same effect. So why spend so much more more for the same effect? Baking soda can introduce too much sodium into your system and the taste is not pleasant and the texture of the water is kind of slippery, like drinking soap water. Try it see if it works for you though. Where can I find the supplement facts on the pH Plasma drops? I have used a product called Prime pH from Innerlight Inc and am wondering about the differences. (from acid reflux) want to try alkaline water and your product has been recommended. Do I have to add the drops to any special type of water, or can I just used boiled tap water that has cooled please? Wonderful product!! It and I have improved my health enormously! Thanks, Alka Vision! Hi I have been using the drops for two days now and I’m wondering,if I intend to drink water mixed with the drops within an hour or so, Will the mixture leach dangerous chemicals from the plastic? Or do I need to use glass all the time? That is a great question! Yes highly alkaline or acidic liquids will not only erode plastics but can also burn a hole right through them given enough time. However, that would happen at ph levels or around 0-3 and 11-14, if your water is 9-10 or lower you should be fine, you have probably see high ph water being sold in plastic bottles at health food stores. As long as you drink your alkaline water the same day you will be ok and the water will stay alkaline the sooner you drink it. can i order a ph test kit cheap? I’ve just started the PH drops and I feel a little drained. Is this one of the side affects? Is this a sign of detoxification? Hello I just purchased the drops for the first time and want to get the most benefit from them. I see that it is recommended that Distilled Water be used. My concern is this…I find distilled water comes in plastic containers which I too am against plastic. Will the drops neutralize the chemical ‘s that are in the bottle or am I better off drinking filtered tap water and placing it in glass quart bottles? I am very excited to try this out as I answered half of your symptoms as a yes. In this case you are probably better off drinking filtered water. hi i was wondering what is meant by ‘pure’ water do u mean distilled or tap? Can the drops be used in any liquid or food? Soup, wine, coffee??? Some people do put them into tea or coffee, we only recommend pure water. Can drinking 64 oz per day of reverse osmosis water with these drops help to reverse osteoporosis? I did not see the ingredients listed on the website. Would you please provide them? Thank you. What is that you recommend? What is the PH of the water after these drops are put into it? I’m just wondering the potassium content as per the label of the drops. I sort of have a low tolerance for such and was wondering if 1-5 drops would be suitable as opposed to the normal 10 drops on the label for someone like myself? There is only about 60 mg of potassium per serving. I just bought the drops for my wife! Shes really unhealthy and gets sick so often . I was wondering if instead of the 10 drops in a quart I can add only 5 drops to a regular water bottle which is half a quart ??? I have had two heart attacks and I’m on high blood pressure medicine and today was put on depression meds. Will this affect any medication? It shouldnt but you should consult your doctor before taking any supplements. I’d try to ween myself off whatever medications you take Kathy if I was you but its your choice. If these products are as good as advertised then you won’t need to take regular meds much longer and Alka products will clean up your heart health and depression. How long does the water stay alkalized after adding the drops? Days… hours… or what? Should last at least that day. I got some pHour salts from youngphorever.eu and tested the amount they recommended in a glass of water and the test strips immediately went to the highest reading (9). This has calcium, magnesium, potassium and sodium bicarbonate. This is a well-balanced blend considering the body pulls these mineral from the bones to balance an acid body. I’m interested in your ph drops if they have all 4 minerals in them. I don’t want to take just one (ex. sodium bicarbonate) because I know taking just one can create an imbalance. So, please list the ingredients in your drops. I would like to purchase from someone in this country….rather than England. Can be PH Plasma Drops be used in conjunction with 100% Organic Sulphur? 100% Organic Sulphur is used to increase oxygen levels in the body creating an unfriendly environment for cancer; similar to what alkaline water does. Organic Sulphur is mixed with water. My Dr. recommended about 100 oz of water per day, if these two items could be used together, then it would make it easier to take this protocol. I am just starting so just wish me luck.